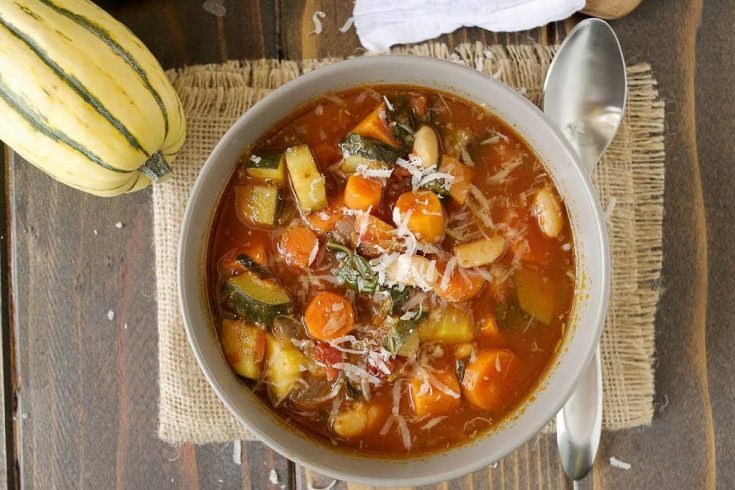 Autumn Minestrone Soup is a seasonal twist on an Italian classic. This is soup hearty enough to be a complete meal anytime the weather is cool and you can mix-up all year by adding in your favorite seasonal vegetables. There’s no reason to buy canned soup when you can make a batch of this soup and keep it in the fridge or freezer. I haven’t eaten canned soup for as long as I can remember. From what I can remember it’s not very good. Despite the ad’s that say ‘new improved flavor’ or ‘lower sodium’, doesn’t matter, don’t care. It’s still salty mush to me that has been sitting in can on a shelf for months and all it’s nutritional value packed up and left before it even left the factory, sounds appetizing doesn’t it? This is how far I’ve gone to make my own soup. When I was living alone in my 20’s, and woke up with the flu and a fever. I dragged myself to the supermarket to get chicken, celery, carrots, parsnips and potatoes so I could have my own homemade chicken soup. This may sound extreme, but I did not have any food in the house and it was just as easy for me to buy the fresh ingredients, get home and throw them all in a pan, than buy a can of soup open it and warm it up. In addition, I knew that I was getting all the best nutrients from my homemade soup. I could live on soup, everyday, 2 meals a-day (yes only 2, I would not go as far as eating it for breakfast). It’s a perfectly balanced meal in a bowl and large batch of fresh homemade soup will survive just nicely in the fridge for about a week, or month’s in the freezer. Another good reason not to eat canned soup. 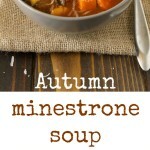 What vegetables to put in minestrone soup? I love the versatility of this soup. I like to mix-up the ingredients according to the season. I added delicata squash, butternut squash or pumpkin for the fall season. In spring you could add peas and asparagus. In the winter, add Brussels sprouts, parsnips or leeks. Add a leftover Parmesan cheese rind adds so much flavor to tomato sauces and soups. If you have one, I recommend adding it as the soup simmers (remove before serving). It wont melt too much, but it does as a delicious flavor that you just can’t replicate. It can add saltiness, so take this into consideration when salting the soup. If you’ve tried this Autumn Minestrone Soup or any other recipe on the blog then don’t forget to rate the recipe and let me know how you got on in the comments below. I love to hear from my readers! You can also FOLLOW ME on FACEBOOK, TWITTER, INSTAGRAM and PINTEREST to see daily recipe updates. Seasonal vegetables, beans and herbs are simmered in beef broth. Just add your favorite pasta. In a large saucepan, heat the olive oil over medium heat. Add the pancetta and cook until it starts to brown. Add the onions, carrots, celery, zucchini and sauté until the vegetables are softened. Add the grated garlic and rosemary, cook for another 2 minutes, stirring so the garlic doesn't burn. Add the kale, potatoes and chopped tomatoes. Bring to a simmer and cook until the kale is wilted. Add the beef stock, beans and pepper, bring to a simmer and cook for 40 minutes until the potatoes and beans are tender. Add Parmesan rind if using. Taste for seasoning, if your stock is not salty stir in 1/2 teaspoon salt, or to taste. Remove the Parmesan rind. Stir in the pasta. *Most store bought beef stock is quite salty so taste and add a 1/2 teaspoon salt if needed. **To add extra flavor, you can add a rind of parmesan cheese to the soup while it simmers. I’ve never cooked with parmesan rind before so am I supposed to add it whole? How much? Do you remove it at the end? I can’t wait to make this tonight for my family! The Parmesan rind is optional. I always have them leftover and it adds great flavor to soups and sauces, if you don’t have it you can leave it out. If you do, add it while the soup simmers (whatever size you have) and remove at the end. I hope you all enjoy the soup. I made this soup for dinner last night. I couldn’t find pancetta but bacon worked very well. I just saw the pumpkin vegetable soup that I’m going to try next, thank you for great recipes. I’m so glad you like it. I think I’ll make some today. Hi Mary, I’m so glad you like the soup. Thank you so much for the great feedback. Your soup looks amazing! I am going to put this on my menu for next week. Quick question, in the directions, you say to add in grate in garlic. Looks like a typo, but I’m wondering if you grated the garlic (at which point I’d just press it) or did you in fact leave the cloves whole? I’m assuming you left them whole, but just wanted to clarify. Can’t wait to try this! Hi Christine, thank you so much for the kind words. I don’t see a typo, recipe says add the grated garlic in step 3 with the rosemary. I would not advise leaving them whole. I hope you enjoy the soup. Hi soup looks so yum! Shall be making this tomorrow…but do i need to soak the dried beans over night? or just add straight away to the pot? Hi Tom, yes, soak the beans for at least 6 hours. I hope you enjoy the soup. Thank you! cooking as i type…starving, looking forward to it! This is such a delicious soup! It’s become a family favorite! After a few runs I ended up adding more veggies than it called for and substituted cabbage for the kale. Sounds delicious Natasha, I like to mix-it-up too. Thank you for the feedback. Exactly my type of soup with plenty of vegetables! What a gorgeous soup for fall, amazing! This is a very hearty and delicious looking soup. Perfect for those rainy days. I really, really wish I had a bowl of this in front of me right now! Looks wonderful. I love this twist! looks awesome!!! Beautiful soup…this may be the magic winter healing soup I was looking for. It is so rainy and grey here rght now that II could do with a huge bowl of this for lunch. I am one hundred percent in your corner on this! I love homemade soup and do eat it for a week straight lunch and dinner, when I can’t convince anyone else in the family to finish it. Your minstrone looks fabulous. Always happy to add another soup to my collection. Pinning, yummy and stumbling this baby! Minestrone soup in autumn is the best comfort food. It’s a family favorite. Perfect to warm me up on cold fall and winter nights! So delicious! Love how hearty this is! I would love a bowl of this tonight. It’s cold and rainy and I don’t feel like going to the store. 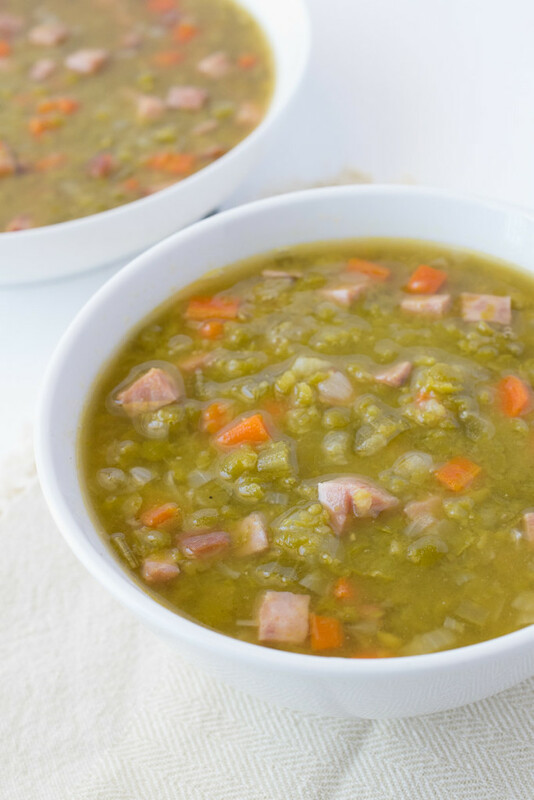 This looks like the perfect soup for this time of year, and I happen to have all the ingredients for it in my fridge just now! I made this yesterday and it was amazing!! I had left overs today too. I did add just a little more garlic then asked and added salt and pepper. But I always seem to add a little more to all my soups. Thank you for such a great recipe. Not only does your soup look delish…but your photography is also absolutely stunning! This looks so good! I love soups, and a good veggie soup is the best! Thanks for the recipe. I’ve pinned it for later. I’m all about “Balanced Meals in a Bowl” This combo is so healthful. I love it. It looks like a delicata in the photo, but I don’t see it in the recipe. This soup looks amazing!! I love the combination of vegetables. YUM! Thank you, it’s one of my favorites. Not only does your soup look delish, but your photography is incredible!